Surface soil moisture is measured using ML2x theta probe (Delta-T devices, Delta-T Devices Ltd, Cambridge, UK), which measures soil moisture averaged over 0 to 5 cm depth and equipped with a HH2 meter for spot measurements and display. Accuracy of measurements is ± 1 %. Detailed theory and calibration procedures are provided in the manual of the device or are also available at http://www.delta-t.co.uk/. 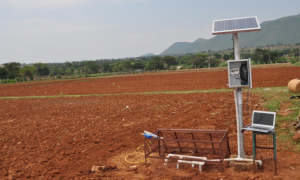 Profile soil moisture are being monitored/measured either continuously or intermittently at regular frequency in the Berambadi watershed for cropped and non-cropped areas using TRIME-PICO IPH soil moisture sensor. The TRIME device generates a high-frequency pulse (up to 1GHz) which propagates along the metal shells, generating an electromagnetic field around the probe. At the end of the shells, the pulse is reflected back to its source. The resulting transit time (3ps…2ns!) can be measured and enabling determination of the propagation velocity, which is primarily dependent on the water content. The volumetric water content is then calculated by the velocity and is shown on the display panel immediately. The probe used by us in Berambadi watershed is T3/44, which has moisture measuring range from 0 to 60 % (volumetric water content) and an accuracy of ±2%. The effective penetration depth of the probe T3 is about 15 cm with the highest sensitivity in the immediate vicinity of the access tube, and decreases exponentially as distance increases. Detailed technical specifications and calibration procedures is available in the TRIME-PICO IPH manual supplied with the instrument or is available at http://www.imko.de/en/products/soilmoisture/soil-moisture-sensors/trimepicoipht3. Continuous monitoring of surface and profile soil moisture is essential to understand the controls of soil moisture in the watershed. Such a data can help in irrigation scheduling, calibration and validation of satellite soil moisture products and in predicting drought. 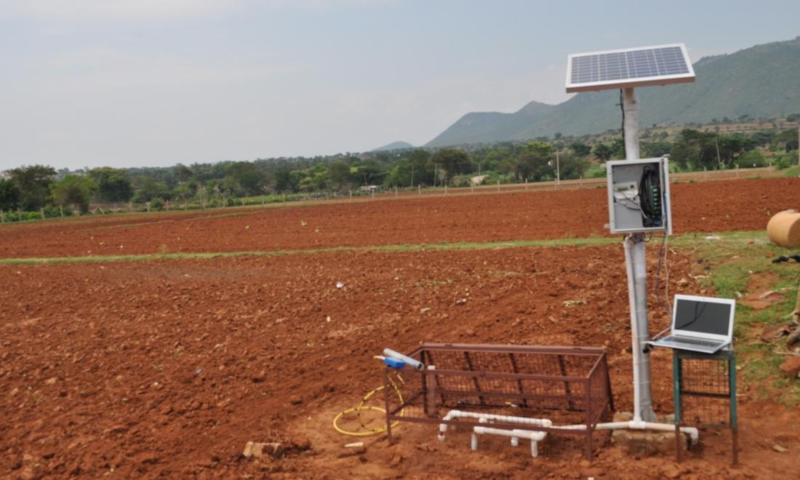 In Berambadi watershed, continuous soil moisture is monitored using (a) EnviroSCAN soil moisture sensor, (b) HYDRA Probe soil moisture sensor and (c) COSMIC ray soil moisture sensor. 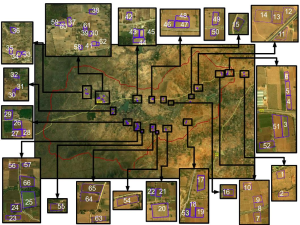 This chapter explains the instruments and protocols for continuous soil moisture measurements. measure water content from a range of 0 to 65%. The Hydra Probe sensor uses the Coaxial Impedance Dielectric Reflectometry method in soil moisture measurement. The Coaxial Impedance Dielectric Reflectometry method of soil moisture measurement employ an oscillator to generate an electromagnetic signal that is propagated through the unit (usually by metal tines or other wave guide) and into the soil. The probe sends electrical signals into the soil, measures the responses, and relays this information to a data collection device known as a data logger. Part of this signal will be reflected back to the unit by the soil, and the sensor will measure the amplitude of this reflected signal and the incident signal in volts. The ratio of these raw voltages is used in a mathematical numerical solution to Maxwell‟s equations to first calculate the impedance, then both real and imaginary dielectric permittivity which in turn is used to accurately estimate soil water content.